So I finally got my new PC setup up and running and got a post out on Sunday. After that, my Internet service went out. That has never happened in the years I've been with them. I contacted the cable company and they said, sorry there is an outage in your area. Go Figure! They turned out great! It was so simple but a little sticky since I chose to use sugar. Here is what I did. I only had 8 snowflakes to stiffen and I took a guess at the amount and turned out right. 1/4 cup of hot water or boiling water. I used the water out of our water cooler. Be careful not to burn your fingers! Mixed until sugar is dissolved. If water turns cooler before sugar dissolves, try 5 seconds at a time in the microwave. I used a cookie sheet with wax paper on it. Not sure if this is good idea or not. Maybe someone can advise. Seemed to work for me without getting wax on the items. 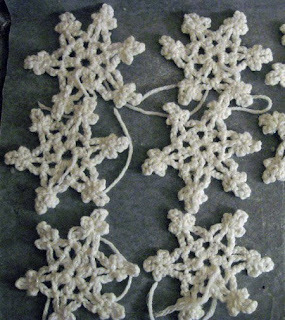 Placed the snowflakes on it and arranged out all the crocheted details. Let sit for at least 24 hours to dry. I went back overnight and they still weren't done, I thought I did it wrong. I flipped them so the other side could get air and then I left them to sit longer and the next time I came back, they were stiff as a board. 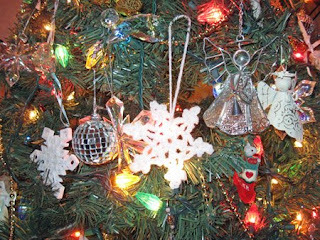 Add a yarn or ribbon hanger through one of the openings and then hang on the tree or add to a gift box. I'M GOING TO TRY SOME OF THESE FOR CHRISTMAS!